In David Humphrey’s painting Cleaning Up, a tough-girl protagonist leans back as she smokes a neon-tipped cigarette and watches a flirtatious interaction between a nearby tree’s hollows and the eyes on her shirt. The tree ogles, and the shirt—or the young woman’s chest—stares back with cheerful, saucy reciprocity. The girl knows what’s up, unperturbed and wise to the occasion of playing wing-woman to such a pair. David Humphrey, “Pounder,” 2008. Acrylic on canvas, 60 x 72″. Courtesy of the artist and Fredericks and Freiser. Photo by Zack Garlitos. Though the romance is rendered cartoonishly, the humor and strangeness of the scene are related to how plausible the interaction is. Cleaning Up takes as a given a world, like our own, where everything can be objectified and commodified. We can read the young woman’s attitude as resignation to life under these rabid, predictable conditions. On the other hand, the painting also proposes inanimate-object relations as a kind of radical free love. When anything can be an object, and objects are treated as things we should want, why shouldn’t they also consciously and consensually want each other? And if that object happens to be attached to me, how can I treat it with humor and respect? 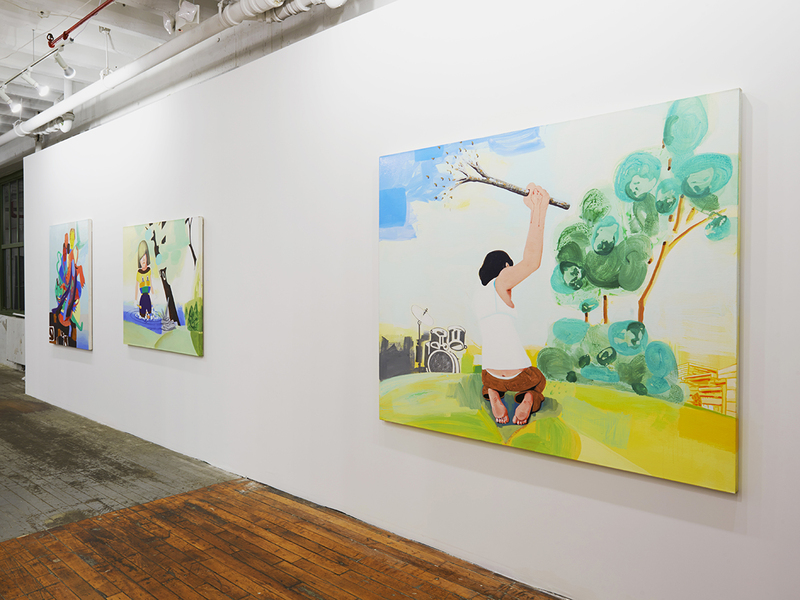 Arresting the logic of wholeness is embedded in the representational structure of Pounder and Meeting, the two other paintings exhibited in Surviving Sandy. The tangle of heads, animal parts, and painted gestures that makes up the central figure of Meeting evokes cartoon scuffles and the indeterminate messiness at the heart of intimacy. The figure is precarious beyond its position at the edge of a cliff. The disparate elements it is made from usually represent identifiable entities like “beast” or “gestural abstraction.” Here, as fragments held together—by movement? feelings? the weather?—they remind us of the missing parts of the body or the brushstroke, and remain the parts they are. Likewise, Pounder seems to be made entirely of incomplete signs and gestures. Take the confluence of the central character’s raised fist and the nearly identical inked version on its surface. The drawn fist could be a permanent tattoo or temporary drawing, a symbol of violence or radical activism. As it is either at odds with the woman’s dress, location, and the seemingly unrelated rest of the painting, the resemblance is circumstantial—the real hand mimics the sign as it grasps a branch in a downward motion—but the coincidence makes the hands specious representations of one another, neither of which tells anything certain about the woman’s identity. As it is, the inked fist is closed, resisting disclosure, while the hand and the branch it grasps set off multiple readings. Frozen against the washy sky, the branch becomes a paintbrush, as if the gesture created the clouds, if not the world. The woman’s pose is a formal corollary to the trees to her right; now, the branch humorously implies a Daphne without a backstory. Beating the ground could be a metaphor for playing the drums off to the woman’s left, or she could just be venting frustration. The woman’s back is turned, hiding both her expression and any object which could give narrative coherence to the painting, or settle the question of the origin of the gesture and thus of the logic of the painting. The hands themselves become the symbolic center of the work, each equally plausible interpretation complicating the metaphor without determining its end. The hands themselves become the symbolic center of the work, each equally plausible interpretation complicating the metaphor without determining its end. The hand is also the center of Humphrey’s process. While the appearance of the different kinds of marks and forms may refer to different aesthetics, degrees of influence of technology, and ideas about imaging, they are all actually and palpably made by the same tool, Humphrey’s hand. David Humphrey has mentioned a couple of times, casually, that you sort of can’t help but to become a better painter if you do it all the time, as though the hand of the painter upgrades itself as consistently as Apple updates operating systems. The notion that the hand has the power to assimilate new ideas, aesthetics, and forms, and reproduce them runs contrary the dull and persistent cliches of “dumb painters” and the opposition between the machinic and the organic/authentic. I imagine Humphrey looking at his hand the way his visage stares bemusedly out from Meeting, treating his hand as Cleaning Up’s young woman treats her chest: implicated in the languages of making but with a tongue decidedly its own.